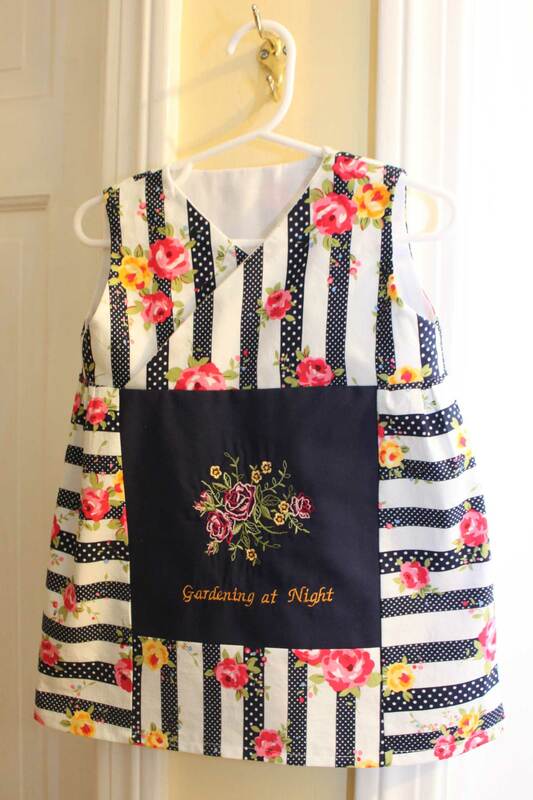 I made this dress from the “Pretty as a Picture” pattern in Anna Maria Horner’s book Handmade Beginnings. I made the 6-9 month size. I used an old blue sheet to provide the fabric for the “picture” panel, then embroidered flowers and the REM song reference, because of course my baby will be such an REM fan, right? This is the dress from the back; I left the panel empty. I liked this pattern; it was simple to follow and the front panel idea is fun and holds lots of possibilities. I was thinking it would be a cute way to showcase older sibling art made for the baby, either scanned in and printed on printable fabric, or done in permanent marker on a light fabric. I didn’t do the French seams called for inside the skirt because I was serging the skirt seams anyway, but otherwise I followed the pattern faithfully. 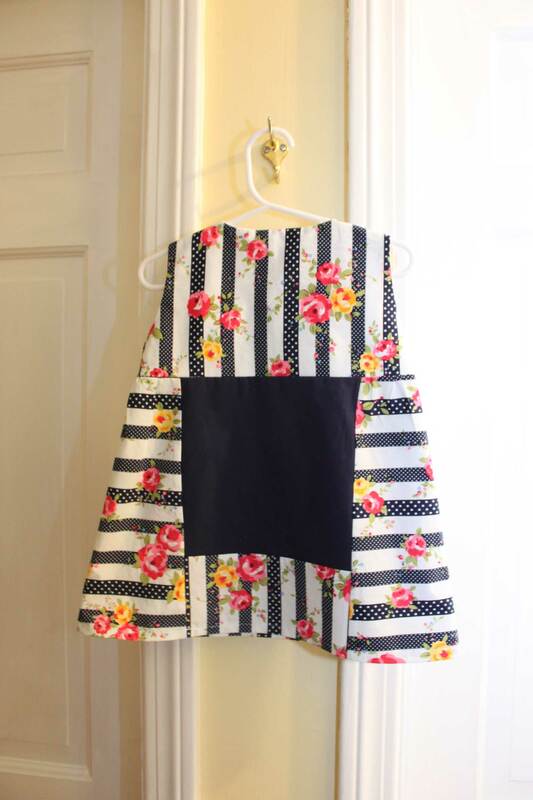 I’m not sure what season it will be when my little one wears this size, but I felt like this dress could be worn as a layer in chilly weather or on it’s own in spring or summer. This project was the only one I managed to photograph of a whole stack of tote bags I made a couple months ago. I bought several yards of a lightweight canvas and used the dimensions of a purchased tote bag that was hanging around here to guide me. I made totes for all the employees who work for my husband at his law firm, embroidering the firm logo on one side (thank you to Hanni at the Sweet as Lemon and Honey shop on Etsy for making the embroidery file!) and the employee’s name on the other. Then I made a couple child birthday gifts, one of which is shown, by doing the same tote bag but adding a child-appropriate embroidery bit and the birthday girl’s name. These were such nice, quick thank-you and birthday gifts that I’m sure I’m going to be reusing this idea again. 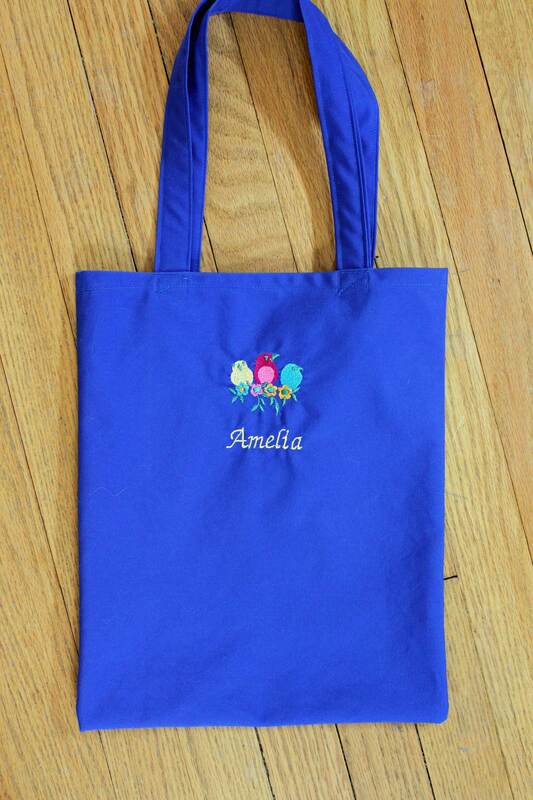 The totes go together quickly and are always useful, no matter the recipient’s age.